Rhythm 'n' Shoes | We'll put the rhythm in your shoes! We specialize in all Latin American Ballroom Dance Styles including Rhumba, Cha Cha, Waltz, Swing (east and west coast), Salsa, Mambo, Merengue, Hustle, Tango (American and Argentine), Bolero, Polka, Quick Step, and Night Club Slow. Everything you're looking for in a band at a price that won't break the bank! We play all types of events including Wedding Receptions, Private Parties, and Dinner Dances, providing the spectacle for your event. From Rochester to Utica and Watertown to Binghamton, have Rhythm n’ Shoes play for your next event! Everything you're looking for in a band! We play all types of events including Wedding Receptions, Private Parties, and Dinner Dances. 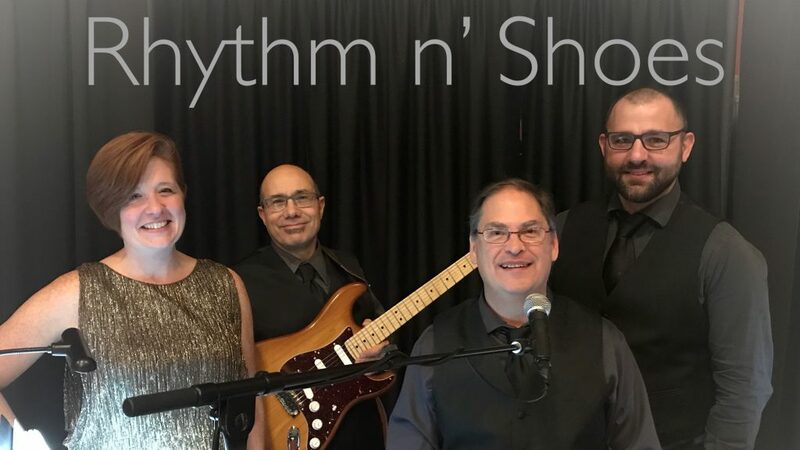 From Rochester to Utica and Watertown to Binghamton, have Rhythm n’ Shoes play for your next event! 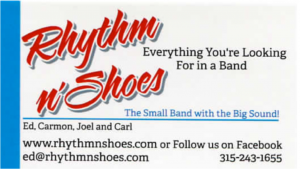 Rhythm n’ Shoes is a Trio/Quartet that has been entertaining audiences in the central New York area since 2014. Described as the small band with the big sound, Rhythm n’ Shoes is the ideal band for venues both large and small. Members include Ed (Drums, Keyboards and Vocals) Carmon (Vocals), Joel (Vocals) and Carl (Guitar). Rn’S has performed at the Syracuse Marriott (Hotel Syracuse), the Springside Inn, the Kallet Civic Center (Oneida), the Tavern on the Lock (Fulton), the Auburn Holiday Inn, the Mendon Country Club (Rochester), the Hilton Garden Inn (Watertown), Roselawn Banquet House (Utica), the Honors Haven Resort (Catskills), and the Syracuse Oncenter, as well as one of the “House” bands at the American Legion (Cicero) for two years and Wysockis Manor (Cicero). Rhythm n’ Shoes impresses audiences with their impeccable three part harmony and extensive instrumental experience. They are the perfect choice for weddings, private parties and dance clubs! Thank you very much for helping to make our wedding reception so special. We were so happy to have our favorite band playing! As usual, the music was excellent and were had a great time dancing along with our family and friends. Everyone really enjoyed your music and enthusiasm. We appreciate all the hard work you did, including learning some new songs for us. You were such an important part of our wonderful evening! We would definitely recommend you to anyone looking for a terrific band. My wife and I have been following Rhythm n’ Shoes for the past couple of years, sometimes traveling over one hundred miles one way to catch a performance. We’re avid dancers and love their music. Rhythm n’ Shoes is the only band we’ve heard that understands the type of music needed and the appropriate tempos for each. The icing on the cake is the fact that they’re all great musicians. Rhythm n’ Shoes is a must hear. You guys have a very unique sound, we enjoyed every song! We really enjoyed last night. It was great to listen to a group that can play dance music and play it well. We are looking forward to another dance in which you play. I love everything about your whole band. You’re not only very professional and sound great but there’s something more in the music that simply evokes a resonance in the listeners that makes your music something we can all experience together. Valentines Dance with rhythm n’ Shoes at Wysockis Manor! Feb 15th from 6-10 pm! Top Tat Dance at the Oncenter! February 2nd, 2019! We’ll put the rhythm in your shoes!